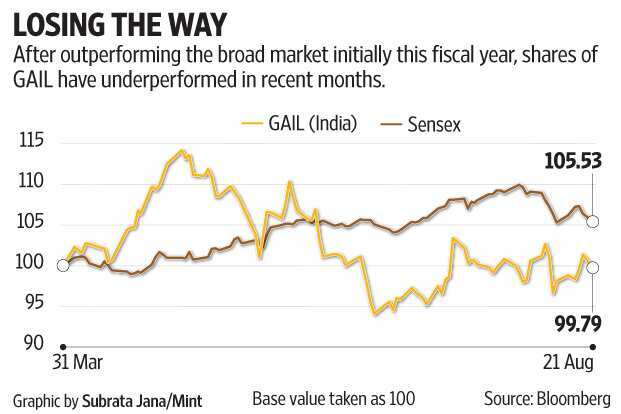 After outperforming the benchmark Sensex initially this fiscal year, GAIL (India) Ltd’s shares have underperformed in recent months. Blame it on subdued oil and commodity prices to an extent. Additionally, a main worry for investors has been potential losses from its US liquefied natural gas (LNG) import contracts. “Management suggest CY18 offtake of LNG cargoes from US terminals could be 5.2mtpa (rising to 5.8mtpa in CY19); however, there is no clarity on how much of this has been sold on to customers (with a Henry Hub linked price)," wrote Badrinath Srinivasan of Credit Suisse Securities (India) Pvt. Ltd in a report dated 10 August. Mtpa is short for million tonnes per annum. Henry Hub-linked price is higher than the current landed imported LNG price. Removing the 1mt sold to Shell and a 0.6mt deal with Gunvor (only CY18), it leaves 3.6mt in CY18 and 4.8mt in CY19 to be sold, added Srinivasan. A lower price could mean losses for GAIL. While that raises a question mark on its future performance, it doesn’t help that the company’s June quarter results were not great either, coming in slightly below analysts’ expectations. In the June quarter, net revenue rose by 6.7% over a year ago to Rs11,406 crore. GAIL’s petrochemicals (petchem) segment delivered a weak performance owing to a plant shutdown during the quarter. Accordingly, petchem utilization stood at ~54%, inform analysts from Motilal Oswal Securities Ltd. Petchem output was lower year-on-year as well as sequentially. The petchem segment’s profitability was disappointing, as a result, with earnings before interest and tax (Ebit) declining as much as 38% quarter-on-quarter. On the other hand, its LPG (liquefied petroleum gas) and liquid hydrocarbons business performed well. Ebit more than doubled compared to the year-ago quarter and was 6% higher than the March quarter. Performance of the segment was helped by higher output. Overall, GAIL’s operating profit increased by nearly a fifth compared to last year to Rs1,899 crore. What next? With higher utilization of the petchem segment, strong margins for the LPG segment and a gradual improvement in the transmission/ trading segment profitability, IDFC Securities Ltd sees healthy earnings CAGR of 16% over FY17-19E. CAGR is compound annual growth rate. The brokerage firm has reduced GAIL’s earnings per share estimates for this fiscal year and the next. Currently, the stock trades at 13.7 times estimated earnings for FY18, based on data from Bloomberg. Valuations are not too demanding but developments on the US LNG contract front are a key measure to watch for.